Time for more then the normal computer activities I usually write about here on my Microcomputer Blog. This is a project I just completed for Wifi at my farm. 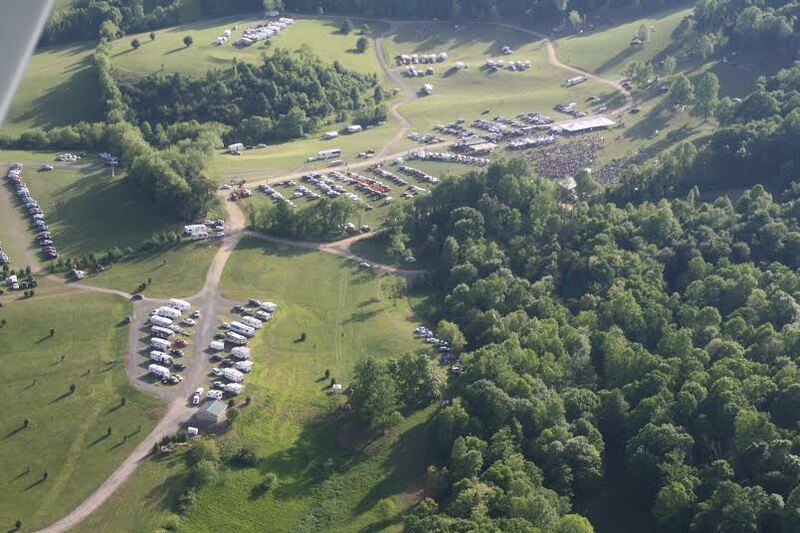 This is the Festival site & RV campground - a part of our 200 acre Chantilly Farm. We do music festivals and many other events during the year. Only a couple of miles from the Blue Ridge Parkway & a very nice Blue Ridge Mountain location. 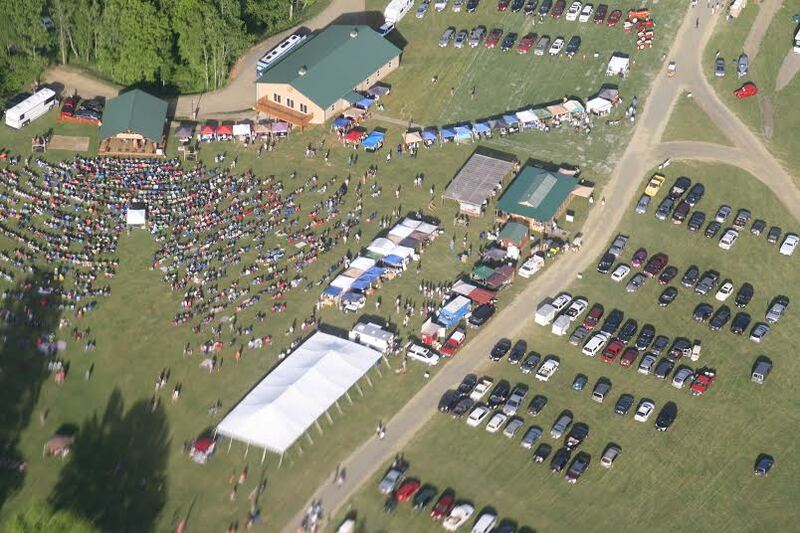 I have designed and built a rather extensive Wifi system for our Chantilly Festival Farm and RV campground. This tower is only one of 4 high tower systems. 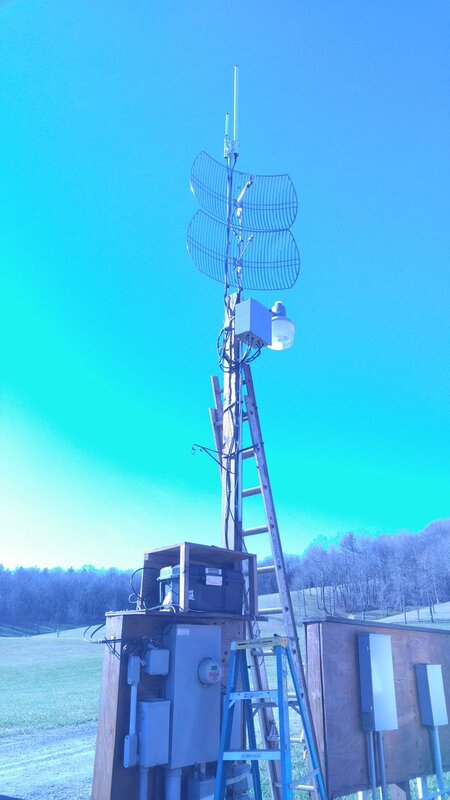 This tower was last used at W4VZH in Floyd,VA and had a nice 4 element 20 meter beam on it. Now is has 4 Wifi antenna's and the extender. I could not easily run an underground internet service to this location in our RV campground so choose to extend a 12Mhz service from a tower 1500 feet away. Here is the construction of this tower site. Ham radio tower re-purposed to hold WiFi extender/repeater. You amateur radio folks will like this blog. I do intend to put a rope and pulley at the top to pull up a wire antenna for ham radio. Finished 28 foot tower with Wifi and antenna's at the back of bath house at campground. The antenna's and Wifi extender. The extender is in the grey box close to the antenna's - this keeps the antenna feed cable lost to a minimum with short coax feed cables. We did have to run 110ac up the tower for the Wifi power. The tower was cleaned and painted with aluminum metal sealer. The hole for tower base was dug by hand 3ft X 3ft X 3ft. Then the reinforcing rods installed. You also see the plywood jig holding the tower mounting bolts in the proper position. One yard of concrete was ordered and it was all used - just right amount. Ed Maybe helps on the farm with lots of projects had a good skill for finishing the concrete. You can see the 3 tower anchor bolts in this photo. After several weeks the concrete was cured and the tower installed on the base. The tower is hinged so I can lower it away from the building and work on the system at ground level. At 77 years old I have instructions from good sources not to climb towers anymore. This is the lowering system - just a pulley with a cable arrangement anchored to the frame of the building. The tower and Wifi system are light weight so this works just fine. I hook the cable to my pickup and use the truck to lower and raise the tower works beautifully. This is the finished project at the bath house (I have 3 more towers with Wifi at the top) and it gives good Wifi for more then 1/4 mile around the RV campground and farm. The whole system is a bit complex and I do a blog describing the operation. This tower in in the middle of the festival field and has vertical antenna for 2.4 & 5Ghz local area and 2 parabolic antennas for sending 2.4.& 5 Ghz to Wifi extender/repeater (the one in photos above) 1500 feet away at RV park/ bathhouse. Works just great. The whole system consist of two internet feeds at 12 & 3 Mhz, 3 Wifi's and 2 Wifi extenders. This gives up good coverage for the whole used part of the farm - about 100 acres and 1/2 mile range for good signals. I will do a blog explaining this system and the antenna's used - 4 ( 15 element yagi's) 8 high gain omni directional verticals and 2 parabolic antenna's. Lots of fun designing and installing this system for a ham radio operator of 61 years and 77yrs old. I have a very nice ham radio station with beam on a tower and amplifier in the farm office. I also have ropes and pulleys in several trees and buildings ready to pull up antennas for field Day.